Ever have those days when you think the cupboard is bare and it turns out it’s not nutritionally naked at all but bursting full of good-for-you tastiness? I had one such recently, thumping a couple of sweet potatoes on the worktop and wondering what on earth I was going to do with them this time. I decided on a simple soup, which turned out to ooze interesting flavours – go figure. 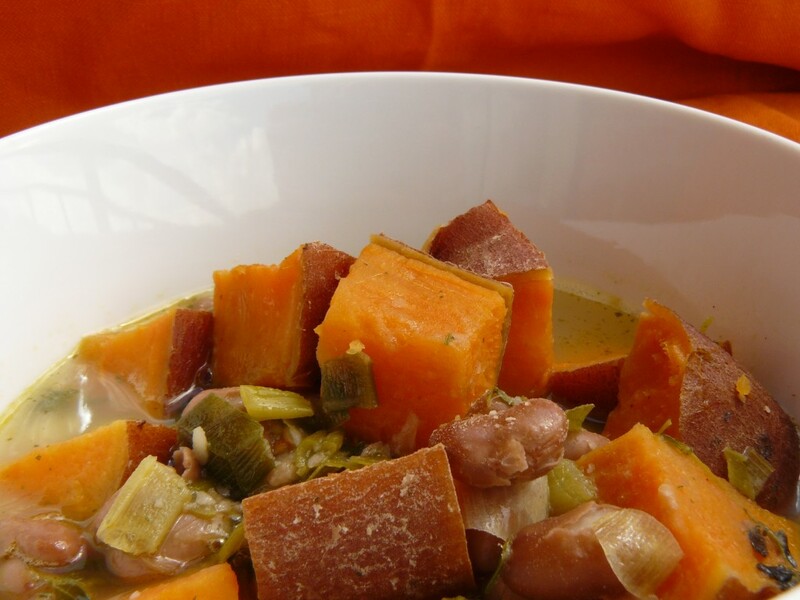 This is a healthy soup to have anytime but it also makes a great recovery dish, with a healthy balance of protein from the beans and carbs from the sweet potatoes. It has a light base too so it’s gentle on your post-run tum. The flavour is quite unusual; the mild tang of the spring onions (green onions or scallions to North American readers) compliments the sweetness of the potatoes really well, and the slightly lemony taste of the thyme makes for a gently complex blends of tastes. As an extra bonus, it’s really easy to make – gourmet cooking that needs only scullery maid skills! Saute the spring/green onions for 2-3 minutes in the oil. Add the sweet potatoes, stir well, then put the lid on the pan and cook gently for about 10 minutes. Add the beans and stock and simmer for 15 minutes or so until the sweet potatoes are starting to soften. When the sweet potatoes are still al dente, add the thyme then cook until they're soft but not mushy. Serve with a wedge of lemon, if you fancy, and crusty bread or crunchy crackers (it's great with Ryvita or posh crispbreads).